All Ireland Senior Down goalie E McKay jumps as L Murphy watches as the ball goes over the bar for Kerry during the Kerry v Down All Ireland Senior Gaelic Football Final, 25th September 1960. 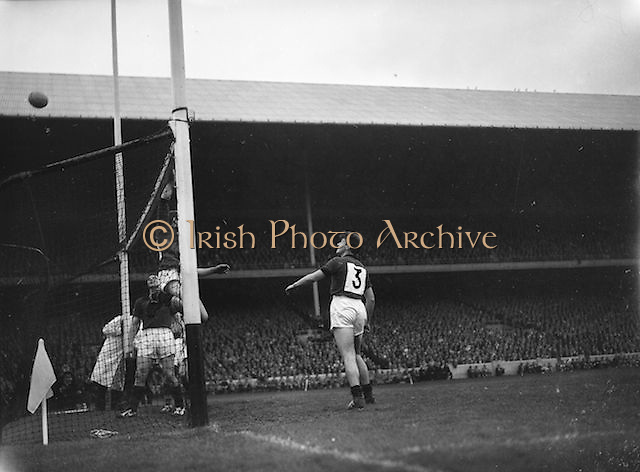 Down goalie E McKay jumps as L Murphy watches as the ball goes over the bar as Kerry get a point during the All Ireland Senior Gaelic Football Final Kerry v Down in Croke Park on the 22nd September 1960. Down 2-10 Kerry 0-8.